In 2007 and 2008 in various articles, this author was warning people that a long term depression or deep recession was imminent for the US that would be similar to the 1930s depression. Subsequently, in the fall of 2008, the stock market crashed. It it wasn't for trillions of dollars of money creation since then, more in a year than during something like 150 years of US history put together, the economy might have gone into a very deep depression. As it is, in spite of a doubling of US debt since the crash in late 2008, people are generally actually poorer! This shows how severe of a downturn this decade has been. But dozens of trillions of credit/money creation in the world economy since 2008 has formed a strange economic situation. Banks, governments and agencies have been buying up more and more of everything with the trillions they publish. This author's economics model is 26 years old now. And the model that was developed about 1989 and 1990 was useful to predict the timing and nature of this economic depressionary era. It is a theory for the Kondratiev Wave of economic depressions, but it is very different than other models or ideas because it is based on the timing of scientific paradigm shifts in physics as described below. The depression eras of the 1930s to early 1940s and the 1830s to 1840s were similar to the current one. There are similar causes due to the way that innovation switched to be focused on "process innovation" instead of "product innovation." These terms are familiar to economists who study technological innovation and the growth and dearth of industries. I've been using these terms to describe the cause of the Kondratiev Wave of depressionary/deep recessionary eras that occur every 40 to 50 years. The 1930s to early 1940s depression era was a long term event that was only cut short by the money creation and war. Right now, the economy is probably right in the middle of a depression period that might last well into the 2020s. In the following parts, I'll describe the evidence that the current depression is happening, outline the causes for this depression era using excerpts from my 1997 article about this, and provide information about a new downturn now near the end of the 2015. Michael Snyder recently described how there are 102 or 103 million working age people without a job in the US. This doesn't include the millions of aliens living in the US without a job, getting government or charity support, or working only part time. As he points out a lot, the economy in the US now is somewhat similar to the 1930 depression era. But instead of bread lines and obvious poverty of the 1930s, tens of millions now get government supplied credit, food, housing, and services though it is clear that obvious poverty has been increasing since 2008. Officially unemployed: As of September of 2015, current government supplied statistics say 7.9 million are officially unemployed. Jobless families: About 20% of the families are without a single member who has a job. 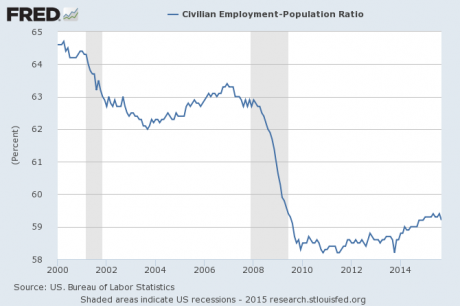 Not in the labor force: The government now says 94.7 million working age people are not in the labor force. This is about the highest number since the 1970s and early 1980s period of deep recession when women still traditionally worked at home. 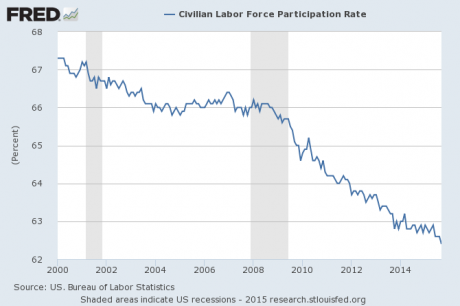 Labor participation rate: It is the lowest since 1977, and there is a particularly striking downward trend since 2008. It is what you'd expect during a depression era, and this is evidence that this is a depression era even though governments and agencies have been ramping up hiring. Number of people getting food stamps: In July of 2015, about 45.5 million people are getting food stamps. This number is almost the same as the record that was set in 2013. By definition, people who receive food stamps are either in poverty or close to it. This compares to approximately 27.5 million people who received food stamps in 2008 at the end of the 2000s economic boom, and is evidence that this is a depression era. Percentage of people getting food stamps: In 2014, about 14.6% of the people received food stamps. This compares to 8.5% of the population in 1976 and 9.7% in 1981 during the deep industrial revolution recession era from about 1972 to 1982. The record was set in 2013 when 15% received food stamps. At the beginning of this depression era in 2008, 9.2% received food stamps. Private charities/feeding programs are busy: By all accounts, these types of organizations have been busier during the last several years than ever before providing for the people who come for food and other things. In the early 20th century, Nikolai Kondratiev (or Kondratieff) wrote about the pattern of depressions that seemed to occur every 50 years in capitalist economies. But he couldn't define a cause. But his research was subsequently followed up by Schumpeter and other economists. But they couldn't find a cause either. At any rate, the pattern continued with a major world depression in the 1930s and early 1940s and another milder deep recession 40 years afterwards that began in the early 1970s and ended in the early 1980s in major economies. The major downturns since the 1890s depression era have been happening every 40 years instead of every 50. This author understood this 26 years ago and thinks that the 50 year spread in the 1800s that was noticed by Kondratiev (1780s and 1790s, 1830s and 1840s, 1890s) was actually an unusual circumstance due to the combination of how unusually quickly the Franklin paradigm developed into the First Industrial Revolution and how relatively slowly the Faraday paradigm developed into the Second Industrial Revolution. Interested readers could peruse his old articles and book on this topic written before in the 1990s and early part of the last decade. He expected and predicted since the 1990s that the 2010s would be a 1930s type depression era, and he explained why this depression era would occur according to the model outlined in those publications and the book that was mainly written in the early to middle 1990s. The model keeps allowing for accurate long-term predictions about the economy and scientific development too. The whole economic cycle is predicated by a cycle of scientific revolutions or paradigm shifts in the field of physics that was happening since before Copernicus. Starting from Copernicus, about every 80 years, plus or minus 7 or 8 years, there has been a paradigm shift in physics. The scientific revolutions happen about every year because the development and replacement of paradigms has been a process involving three generations per paradigm since before 1506. The author wrote many articles about that. This current era of technological revolution is based on the QM-Relativity paradigm developed by Einstein and his successors in the early to middle 20th century. That paradigm allowed for the revolution in technology based on QM theory that emerged in the late 1960s and 1970s. When the baby boomers who were at the forefront of this technology reached their 20s and 30s, they started the major high tech industries of today. Important new inventions of everything lasers to microchips to PCs found numerous applications in the 1970s. Many major new industries emerged in the advanced economies such as the US that allowed for an increase of productivity and a burst of production and tens of millions of new jobs. As described in much more detail in early articles and in his book, each period of scientific一industrial revolution is a generational process involving successive generations of the workforce. It is when the generation of technology inventors reach their middle age as when the baby boomers reached their 40s and 50s about the year 2000 that the emphasis of companies and economies switch from the innovation of products to the innovation of ways to dominate production and produce standardized products (process innovation). In the US, this process innovation era began about 1999 and is reflected in the sudden doubling of the productivity growth rate to over 2%. Similar doublings of productivity growth happened in 1919 in the US and about 1820 in Britain. During technological acceleration eras, competing companies aim for market share in markets that become oligopolies or monopolies as we see has been happening during the last decade. Companies find various ways to cut the cost of production of standardized products including automation, economies of scale, and unemploying their labor force. This is what causes a depression after an initial 10 year or so "boom" period: 1820 to 1830 in Britain, 1920 to 1929 in the US, and 1999 to 2008 in the US are examples of this kind of economic boom. The oligopolies emerge during this period of "industrial shakeout" associated with a great increase of corporate bankruptcies, mergers, acquisitions and associated workforce reduction. This type of economic depression era is called a "technological acceleration" depression. It could also be called a "process innovation" depression. As explained in many articles, this type of depression differs much with industrial revolution depressions or deep recessions such as those that occurred in the 1890s and 1970s. Since the prior two technological acceleration depressions shared similar characteristics and it made sense that this technological acceleration period would share those characteristics, he predicted that the same circumstances were about to cause another depression or deep recession at the end of the decade of the 2000s. These circumstances in 2005, 2006, and 2007 included an increased emphasis on automation, unemployment increases, and record high corporate and consumer debt, and other aspects of the formation of oligopoly markets. These same circumstances occurred in the "boom" eras of the late 1920s in the US and the late 1820s in Britain. It was clear that there was an increase of mergers and acquisitions as there were at the end of the prior two "boom" era and that there would be a great increase of corporate and personal bankruptcies. As I described in the article, there was much evidence in 2007 that these depressionary circumstances had begun. The model and predictions of that article proved very accurate. The letter began: "An economic depression or major recession is likely in America in the next few years. In 1989, I developed a theory about economic depressions arising from scientific revolutions in physics.1 The theory assumes that there is a causal connection, and history shows this. The theory predicted several major events in industry and science that have occurred when predicted. This is offered as evidence that the theory has predictive ability. The theory predicts that a depressionary period is likely due to cessation of major new product introduction, historically high debt, automation, and the labor displacing effect of the formation of oligopolies. These economic features are now observed in the U.S. economy. Therefore, a depression or major recession is likely in the next few years." The author then went on to discuss the accuracy of the predictions and described the theory a little. The letter continues: "If any of these predictions hadn't turned out to be so accurate, it would have disproved this theory. But since these predictions from 1990 have proved so accurate, it seemed proper to warn people of a possible depression or deep recession in the near future. Even if the idea of an 80 year periodicity of revolutions seems untrue to you, if these trends continue of rising productivity due to the displacement of labor by automation, oligopoly and efficiencies of scale, increasing business and consumer debt, and the satiation of consumer demand of the available types of products within the constraints of their budgets, what will the outcome be but a general decrease of consumption demand?" In the above excerpt, I was explaining to people that my predictions for the "boom" era of the 2000s had proved accurate. These predictions from my 1990s articles and my book that was written mainly in the early to middle 1990s titled The Periodic Production of Rationalized Phenomena and the Past Periodic Depressions were that the US was about to enter an "economic boom" era with a doubling of productivity growth rates similar to the 1919 doubling, associated record consumer and corporate debt similar to the late 1920s, and a surge of M&A activity mirroring what happened in the US in the middle to late 1920s. All these predictions proved accurate by 2007. The predictions were validated: There actually was a boom of M&A activity during the middle of the decade of the 2000s. There actually was record high corporate and consumer debt due to the corporate M&A activity, increased emphasis on automation of production or offshore production, and a corporate emphasis on increasing market share by cost cutting and gaining economies of scale. So the predictions from the 1990s about what the "boom" period would be like proved correct. Consumers had taken on record debt levels (up to that time) in order to buy the new consumer electronics products that had come available such as PCs and flat screens and other products much as the consumers of the middle to late 1920s era had record high debt levels because of their borrowing to obtain the private automobiles and radios and other electrical appliances that had become available by the middle 1920s. In my book and older articles, I go into some detail to try to explain what kinds of new products had become available in the "boom" eras of the 1820s and 1920s, and I predicted in the 1990s that major new consumer products would become available in the decade of the 2000s that will spur consumption demand and consumer indebtedness. Though I probably couldn't guess it at the time, these products included cell phones, smartphones, and flat screens. One of the major causes of depression is what I wrote in the excerpt: "the satiation of consumer demand of the available types of products within the constraints of their budgets." What this means is that I was predicting (then in 2007) that the producers in the US economy and other advanced economies were already experiencing and would be increasingly affected by a decrease in demand for the standardized products that the companies in the increasingly oligopolized or monopolized fields were producing. What this means, for example, is that an individual with a smartphone doesn't generally need to buy another one for himself. One phone is sufficient. People don't usually want more than one or two PCs or portable computers. For a 1920s example of demand satiation, families that had one family radio in the house didn't usually need to buy two or more. Families with an automobile back then didn't usually need to buy another one or more. Automation: By 2007, there was a clear trend towards automation of production and shifting of production offshore such as to China or Mexico. This was keeping labor costs (worker pay) low but permitting companies to increase profits and production. This is what caused the doubling of productivity about the year 1999 similar to what happened in 1919 and 1820 (in Britain). Modern electronics, telecommunications, and computer technology is allowing the offshoring of both industrial production and services. More and more, service industry type tasks is done overseas by workers earning much less than would be considered even a minimum US wage. Now, the replacement of most industrial, service, and scientific tasks by computers and robots is a popular topic in the news. This robotics and computer automation trend was predicted for this technological acceleration depression era at this time in the period from 2000 to about 2030long ago in the early 1990s in my book. See below. This wasn't the only article that was published in the end of the last decade about this depression era and future technological, industrial and economic development. He wrote another one and submitted it to a science conference in 2008. That article says: "The economic predictions were about the transformation of industry during the 1990s and 2000s, that technological acceleration would start about the year 2000, that there would be an economic boom during the decade of the 2000s, and that an economic depressionary period would start about 2009 . What economist predicted any of this a decade or two ago? All these events have happened. I predicted that major industries based on the quantum mechanics theory would develop and change the culture of the technology leading economy during the 1990s and the decade of the 2000s. This happened." The author has been writing about this 2010s depression era since 1990. Most of the manuscripts were not published. By the middle 1990s, only Harry Dent was making a similar prediction of a "boom" in the decade of the 2000s followed by a depression in the 2010s using a different model that is somewhat similar to those that both emphasize the role of successive generations in this cycle of depressions, but he specifically focuses on demographics. This theory doesn't focus on demographics, but his theory is interesting. This theory posits that each generation has a specific and different role in the development of of each scientific/technological/industrial era. So again, the predictions for this decade based on the old model is proving accurate. This is a depression era where the main cause is the shift in technological innovation from product to process innovation; the onset of this shift is something that happens about 30 years after the start of an industrial revolution when the "effective experimenters"/industrial revolutionary inventors reach middle age. The start of an industrial revolution can be defined more precisely as the start of the industrial revolution depressionary era such as at 1890 and 1972. The standardization of products and lack of invention of any major new products during the last ten years or so is what is expected in this stage of industrial development as the QM industries mature in the typical 80 year timing from industrial revolution to the next industrial revolution. The standardization of products is what is enabling major corporations to shake out or buy out competitors and is helping to support oligopoly or monopoly market structure. This is why people can expect greater unemployment, greater automation and computerization of production, higher human labor productivity, layoffs due to oligopoly market tightening, much more personal bankruptcies and corporate and bank bankruptcies, and a second dip. In the 2007 article "Economic Depression or Deep Recession Coming Soon", the author described how his predictions from the 1990s about record high debt levels by 2010 were coming true. He was trying to explain to readers that the high debt at that time would be part of the cause for the imminent 1930s style depressionary era. "Extremely high debt levels were predicted for the lead economy. This is evident. As happened in the late 1920s, the U.S. has record business and private debt as businesses struggle to survive as oligopolies formed in each industry and the survivors tried to gain market share. In 2005 and 2006 a record was set for mergers and acquisitions in the U.S. economy. Mergers and acquisitions are at the highest level since the Great Depression...Total corporate debt that has financed the corporate drive for market share and for corporate survival is the highest since the Great Depression. Total American consumer debt reached $2.2 trillion in 2005, up from $1 trillion in 1994. And, 2005 was a record year for personal bankruptcies." Economic downturns tend to happen every four to seven years. Late last year in December of 2014, this author was warning people in "The 25 Year-Old Economic Depression Model That Gives Accurate Predictions" that a second dip was about to occur in this depressionary era. This second downturn is reminiscent of the downturn that happened in 1938. He was warning that the downturn would be more severe than the first one that was assuaged by all the government intervention and all the debt/money creation of the last seven years. In the third and fourth quarter of 2015, the downturn is becoming evident. Jump in labor layoffs: In the third quarter of 2015, according to Challenger Gray, large US-based companies had announced 205,759 layoffs. It was the highest number since the 240,233 in the third quarter of 2009. Year-to-date, the companies disemployed 493,431 people. This is up 36% from the same period last year. Global recession: It was just announced in the middle of October 2015 that global trade is down 8.4% year on year. New surge in mergers and acquisitions worldwide: In 2014 and especially 2015, there has been a new surge of mergers and acquisition activity in the US so that it now equals the peak hit around 2006 and 2007 in the US of about 1.6 trillion dollars annually. In the entire world, in 2014 and 2015, merger and acquisitions are about at their 2007 and 2008 peak of about 6 trillion annually. 2015 has been a record year for M&A: The general drop in consumption around the world is part of the cause for record large M&A deals. In October, Dell acquired EMC for 67 billion. It was the biggest deal in the history of the electronics industry. Large buyouts and mergers such as this are happening all over the world from the US to China to the Middle East to India and almost every industry including the food industry and automotive parts industry. The dollar amounts are reaching or surpassing the highs set from 2006 to 2010. Record being set for M&A in the technology sectors: The high technology sectors such as semiconductors and PCs especially has been consolidating into tighter oligopolies. 2015 record M&A in the US: By September 8, 2015, there has been a new US record of 1.5 trillion USD value of M&As. The new round of M&A activity is itself a sign that the second dip is at hand because after a merger or acquisition, the bigger companies streamline their workforce to increase productivity and cut costs. The author expects record layoffs from these new megacompanies/oligopolies that were formed in 2014 and 2015 during the next six months. In general, in the third quarter that ended September 30, 2015, the stock markets of the world's top 10 economies all fell at least 10 percent from the peak reached in the first or second quarter of 2015. China stands out with a 41 percent fall this year by Sept. 30. If it wasn't for great government and bank intervention, the stocks would have dropped much more. See the chart below that shows the percentage drop in their main stock indices from the peak. 1. US: NY Stock Exchange Industrial Ave.
#1 The United States: By Sept. 30, the Dow Jones Industrial Average was down more than 2,000 points from the peak of the market. In August, stocks declined by more than 500 points on consecutive trading days for the first time. #2 China: The Shanghai Composite Index decreased 41 percent since hitting a peak in June 12. PMI data shows that the Chinese economy is slowing down. #3 Japan: The Nikkei has been moving violently lately. By Sept. 30, it was down more than 3,000 points from the peak that was hit June 24, 2015. #4 Germany: About one-fourth of the value of German stocks was wiped out this year from the peak in April 10. #10 Russia: The smallest of the world's top 10 economies, the Russian stock market did about the best by the end of the third quarter in percentage terms. It fell about 10.6% from the peak in February 13. Stock markets rising in October: Since the end of the third quarter, the stock markets have been rising across the board in these ten biggest economies by the middle of October 2015, but this volatility itself is a sign of an imminent stock slump. M&A increasing: As explained above, M&A activity is surging recently, and just as the 2006 and 2007 in the US peak led the crash in 2008, this is part of what is leading to a new rise in unemployment or "out of workforce" people and a second dip. Corporate bankruptcies: As more of the world economies go into recession, there will be more corporate bankruptcies, bank bankruptcies, and personal bankruptcies. The oligopoly market structure will probably tighten significantly in the next few years. This will cause much unemployment. As I described in articles and my book from the 1990s, the decade of the 2010s will see a new corporate emphasis on using machines to replace human labor. They want to maximize profits and increase productivity just as the corporations emphasized automation in the 1930s and early 1940s and in the 1830s and 1840s during those technological acceleration depressions. So expect a rise of unemployment and meeting fewer and fewer human workers wherever you go during the next seven years. On the other hand, labor productivity for those humans actually working will increase significantly. Those tending and programming all those machines will be able to produce much more with the machines than humans could before. Labor productivity will increase significantly by the end of this depression era. See my previous articles for guesstimations about how much productivity will increase in whatever economies are the most advanced by 2030. Right now, all the money/debt creation is fueling the continued existence of low wage labor servicing the richer people (waiters, restaurant staff, beauticians, hotel staff, resort staff, etc). But in a crash type economy or a severe second dip, these kinds of low wage jobs will probably be scarcer. People with skills to manage and program and tend high tech machinery will be in relatively higher demand then compared to low pay redundant labor. So labor productivity stats will jump if the US continues to be one of the leading advanced economies. Warning! Warning! More and more publications are informing the public about the automation of factories, supermarkets, and even restaurants. Some widely publicized academic researchers are claiming that something like 40% of US jobs may be automated within 20 years. The Bureau of Labor Statistics predicts that by 2022, only 7 years away and most likely within the duration of this depression era, jobs for farmers, sewing machine operators, data entry keyers, word processors, and typists will all decline by about a fifth. Even in low wage countries: Big companies with factories in low wage regions such as Foxconn are also announcing plans to automate and eliminate a large percentage of their labor force. As happened in the 1930s, this will spur productivity but cause a more severe depression era. All in all, as far as this author can determine, the model from 26 years ago has been accurate in predicting the long term events of a third industrial revolution based on Quantum Mechanics theory and technology, a doubling of labor productivity growth about 2000, a boom period in the decade of the 2000s followed by a Kondratiev "technological acceleration" slump in the 2010s, and extensive automation of production utilizing robots and computers. All the predictions about record high debt levels just before the onset of a financial crisis at the start of the depressionary era proved correct. What is yet to be seen for the future is the second dip and maybe a third dip, accelerating productivity growth due to increasing economies of scale and automation in the big oligopoly companies, and a possible 4% annual productivity growth rate by 2030 in whatever economies in the world lead technologically. This author is envisioning that perhaps certain cities or high tech regions around the world may exhibit such record high growth rates (similar to the late 1940s and 1950s US productivity growth surge), and that these regions or cities, even small ones, may by the power of intensive automation of production supply large regions populated by lower income people. Emerging as victorious after WWII, the US became the factory of the world supplying a world devastated by war, and large regions in the third world opened up for consumption of US products. Something like this might happen again with a relatively small population producing most of the world's total production via sophisticated technology people can't envision now in 2030 or so. Recent GDP and world trade statistics do suggest that the second dip is already beginning. But another round of probably even greater money publishing may temporarily delay a downturn. But statistics of falling household income is undeniable evidence that this US slump is the worse since the Great Depression. A lot of household income is simply government handout. So expect mounting unemployment and increasing automation and use of robotics and computers everywhere, and expect news someday soon that the US is in a recession. It will probably be called a "second dip." This author invites readers to study the whole model that explains everything from the 80 year cycle of scientific revolutions evident in the history of physics to the way the physics/technology cycle causes depressions/deep recessions every 40 years.